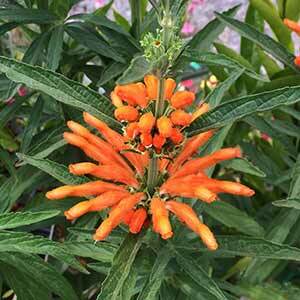 With large orange flowers in whorls, Leonotis leonuris is commonly called the Lion’s Ear plant. This is an evergreen perennial shrub that holds its flower son upright stems. Also known as ‘Wild Dagga’ this is a native plant from South Africa , after flowering the seed heads that form are often used in flower arrangements. This is a species that will self seed, deadhead after flowering to prevent self seeding if desired. Looking great in a cottage garden it is also well suited for planting as a low informal hedge or border. Best in a humus rich moist soil, Leonotis leonurus will require a little extra water during very dry summers. Height – To around 2m in good conditions.’ Spread – To around 1.4m. Flower colour – Bright Orange. Flowering period – Mid to Late summer to Autumn. Drought tolerant – No to medium. However fairly hardy. Prune back after flowering to maintain shape and a compact bushy habit. We like to cut back to 15 to 20 cm each year.